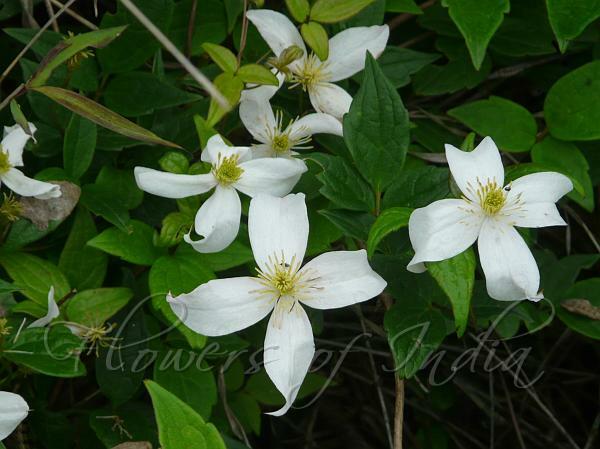 Manipur Clematis is a robust woody climbers with branches tough, round, hairless. It is closely similar to Anemone Clematis, but can be distinguished by its narrowly long-pointed sepals. Sepals of Anemone Clematis are obovate blunt. Leaves are fascicled at the nodes on short branches, ternately 3-foliolate;.leaf-stalks 3.5-7.5 cm long; leaflets 3 or 1-4, variable; ovate, ovate-lanceshaped or lanceshaped, rounded at base, coarsely and distantly sawtoothed or sometimes incised along margins, pointed at tip, 1.5-7 x 1-3.5 cm, appressed hairy, especially beneath, more particularly on nerves or becoming hairless; leaflet-stalks 3-8 mm long. Flowers are 2-3 in leaf-axil fascicles, sometimes reduced to one, on long flower-stalks, large, 4-8 cm across, showy, white, cream-yellow or purplish outside, scented; flower-cluster-stalks round, 7 - 10 cm long, finely velvet-hairy; flower-stalks 3 - 8 cm long, hairless. Flowers have 4 petal-like sepals, widely spreading, valvate in bud, oblong-elliptic, narrowly tapering, 1.5-2 x 0.7-1.25 cm, nerved. Stamens are many; filaments linear, hairless; anthers yellow, introrse; connectives hardly projecting beyond anthers. Achenes are in a cluster, ovate, obovate, compressed, pointed at both ends, about 5 x 4 mm, with up to 4 cm long feathery cream-coloured tails. 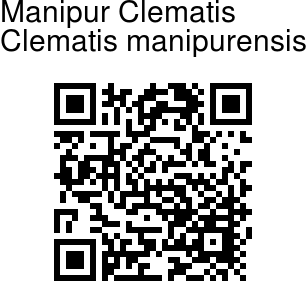 Manipur Clematis is found in Manipur, Nagaland and Myanmar. Flowering: April-May.